My life and the existence of Fail Squad Games is due to the creation of a game by Gary Gygax and Dave Arneson – Then later Frank Mentzer got me hooked solidly! As a young teen after some difficult home situations, my school work and attendance were dropping fast. I don’t know where I was headed, but it was nowhere pleasant. One summer my friends and I discovered the Red Box D&D, we played to level 3 many times. Not long after we pitched in to get the blue box just as we were given the AD&D Hardback books by someone’s cousin. My friend’s grandmother saw the Satanic Panic on TV and demanded the books be burned or otherwise destroyed. I begged my friend to give them to me, $40 dollars later he acquiesced. He thought he had bilked me, but it was the best $40 I ever spent, and it likely saved me. That next summer, things at home were so unstable that I went to stay with my grandparents at their camp on Gardiner Lake in “downeast” Maine. I brought the AD&D Gary Gygax books and absorbed every word that summer escaping my life and living in another world. The adventures I imagined were interrupted by long days on the lake fishing with my grandad’s dog Pinky. I became a reader, an imaginer, and was incredibly inspired by the art work and writing. I gathered some new friends when I got home and we played whenever we could manage it. I was not the same person, I was better, the roleplaying of problem solving affected my real world problem solving. I thought the dream of living in the world of RPGs would always be a dream. In fact, I was recently asked to give a TEDx talk, and part of this story was at the center of my talk. 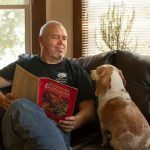 Now, because of Gary and his dream, I am living mine as a full time RPG creator and artist. I would have no words for him if we were to meet today, so I just thank him on my own. My one wish that will never come true, was to play at his table one time. While I missed that dream, all the others have come to pass, and I am humbled and honored to contribute to the RPG community and Gary Con every year.